Does the idea of paying cash for Christmas seem impossible to you? It’s not, if you’re willing to put forth some effort, plan ahead, and stick with it. A budget might seem like a no-brainer. But it’s highly important. After all, if you don’t know how much you have to spend in the first place, how are you going to stay within your budget? Sit down within the next few days, if at all possible, and look at your current expenditures and your income and decide what is a realistic budget amount to set aside for Christmas. If you think you’ll be tempted to overspend, even when you have set a budget in place, I heartily encourage you to use a cash envelope system for your Christmas gifts. Take the money you’ve allotted for your Christmas budget out of the bank and put it in an envelope. This is what you have to spend for Christmas. Nothing less, nothing more. You know what this will guarantee? That you won’t go over-budget! The beauty of using cash is that it provides instant self-discipline: when the money’s gone, it’s gone. Sticking with your Christmas budget may mean that you need to pare down who you buy gifts for. Evaluate your gift list: Do you really need to give a gift to your uncle’s neighbor’s dog? I’m pretty sure Fido will survive just fine without another fancy chew toy, so save your money and use it to buy gifts for those you really care about or want to bless. 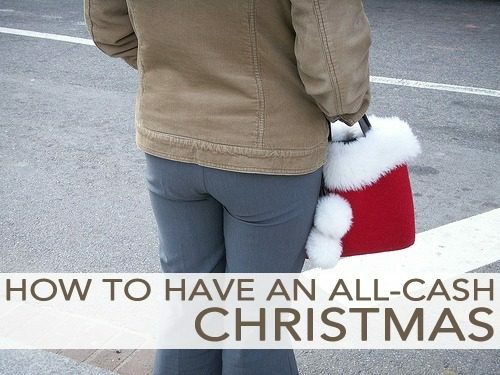 Don’t wait until two weeks before Christmas to do your shopping. The sooner you get started, the better chance you’ll have of finding great deals for everyone on your list. Create a Master List for everyone you need to buy for and then be on the lookout for deals that would be perfect for them. Online Daily Deal Sites — I have a listing of my favorite online deal sites here. Most of them will be running good sales leading up to Christmas — often with free shipping. Black Friday Sales — The day after Thanksgiving, known as Black Friday, is when many retailers will offer some of their biggest sales of the season. If you don’t enjoy throngs of crowds, consider shopping online on Black Friday. Best of all, when you shop online, you can do it from your living room couch in your PJs! Online Deal Forums & Blogs — There are many, many bloggers like me who are doing a lot of legwork to save you time and money this Christmas. Find a few money-saving blogs, sign up for their email newsletters, and be kept up-to-date with all the great offers each day. Remember, only purchase those items that are within your budget. If you go over-budget, it’s not a good deal — no matter the price! If you’re ordering online, make sure to check for an online coupon code from RetailMeNot.com and to shop through Ebates.com to get cash back on your purchase. Every little bit helps! Since many of the best deals are online, I suggest that you either use Paypal and refund the money to your bank account immediately from your cash envelope or take the money from your cash envelopes and purchase gift cards for your online purchases. This is a bit more of a hassle, but it means you don’t have to worry about any staggering credit card bills come January! If your budget is really slim this year, don’t let that discourage you. You can still give the gift of time — maybe a certificate for free babysitting for your friend who has two young children or what about an offer to clean a busy friend’s house? Get creative and think about things you could give that would be meaningful but would fit your meager budget. Food gifts are a great option, especially if your recipient has a sweet tooth. And there are a plethora of handmade gifts that are both inexpensive and practical, and would be appreciated by anyone. I have even more ideas on how to save you money this Christmas and help your holiday flow! 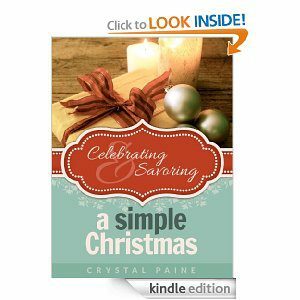 Check out my new e-book Celebrating and Savoring a Simple Christmas, available on Amazon for just $0.99 for a limited time. How do you save money and stick with your budget during Christmastime? I’d love to hear your ideas! Crystal Paine is a wife, homeschooling mom of three, and author of the brand-new ebook, 21 Days to a More Disciplined Life. For more encouragement to get your life and finances in order, visit her blog, MoneySavingMom.com. Previous PostIs Your Money Ready for an Emergency?